Event venue plays a pivotal role in the success of any event. There are numerous factors of events that do not seem obvious until you finalize your event venue. The decision making regarding venues, start taking shape before 2-3 months. For event organizers or hosts, this duration is nothing less than solving a riddle. The venue decision is so subtle that until the last minute of the event, organizers remain stressed about the decision they have taken. A decision that is capable of changing their business and image dramatically. Sitting on the heap of uncertainties the event planner has to radiant their events smoothly, for which picking up the right venue is very necessary. All the metrics, stakes and returns finally boil down to the decisions of venue fixing. It’s like a central beam in the merry-go-round, where all objects swirl around the central axle. Before finalizing the venue, event planners or hosts should know their guest’s expectations and what they want for their event. If this is done, half the battle is won, the rest half is to ensure that everything the venue offers is up to the mark. 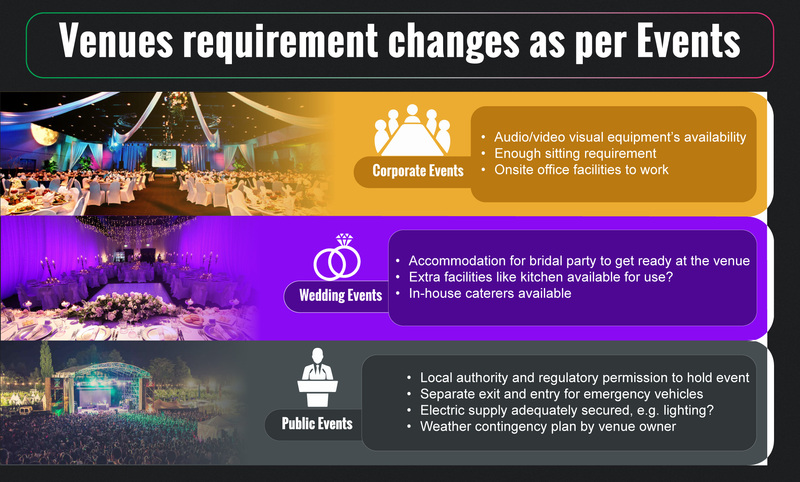 Your event requirements may vary depending on the type of your events. See Infographics below for any events, the venue choice is a typical scenario and a complex one. Settling down with available facilities alone will not be enough for event success, but service quality needs affirmation. That’s what the VSC (Victory Services Club) a renowned event club in U.K also says. So, it is identical that service quality can’t be compromised on the number of facilities available while booking the event venue. The survey seemed entirely truthful for venue choice again when feedback was taken from visitors attending one of the prestigious events. The above survey is just a few insights on the inconveniences experienced by guests related to venue, but there could be more about it like catering services, venue surroundings, social program, etc. So overall the host has to double-check on the service quality promised by the venue owner. 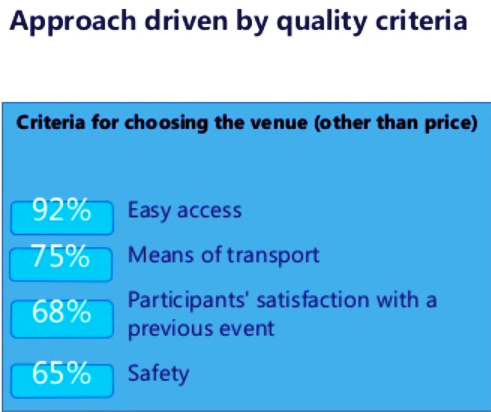 To segregate each of this quality factors, we add here a report by “European pulse.” The numbers tell what criteria can influence event venue choice beside the price. Let’s elaborate above point in detail. We will look into small but critical pointers for event organizers that can be a show stopper if attention is not paid. Observe any well-organized event the parking space arrangement is their top-priority list. Something that impacts the event success explicitly. Events with squeezed parking space will see the scant presence of event attendees. It puts-off event attendees’ way before they start walking to the events. Venue size should be “Fit-to-event” and play, equalizer to the number of event attendees. Anything less or more to the size of the venue will make your event look sluggish and bizarre. When attendees are less in number and event space vast, it elicits the feeling of missing out on something. Attendees will look lost and stroll through an event without any interest. Similarly, an overcrowded place will restrain anyone from taking complete pleasure in the event. In either case, the charm of the event will lose. The pre-event survey could be the best possible way to gauge the number of attendees coming to the event. Sometimes event organizer spends a lot of money after ultra-modern facilities, food, and beverage, corporate learning centers, etc. But the picks venue site out of the skirt or far distance, leaving the event as a dreadful experience. Travelling long distance venue might not be convenient for all visitors. A better venue choice is mandatory for planning the theme based event. Decors, flooring, rooftops, and lighting all should go in sync with the theme. You can cross check with the previous event held in the same venue and compare your theme based event with it. Take help of professional wedding planners for better venue choice. Today’s event has shifted from closed-wall events to live broadcasts on account of technology enhancement. Bluetooth, Wi-Fi, and mobile like to talk with each other during events and they have inherited actively with all the other essential amenities of the venue. Without these facilities, the event becomes less engaging for attendees. Side add-on of the venue has excellent value overall for enhancing your image as the event organizer. Check whether the venue owner provides extra facilities like wheelchairs and first aid facilities for aged and sick people also check for Security and Fire Safety equipment. Make sure that the shopping mall is close by, in case guests want to go for a window shopping. These are all small things but noticed by attending guest and pins, an extra badge to your reputation as an event organizer. Ensure that all your event related contracts are documented and signed by an authorized person. 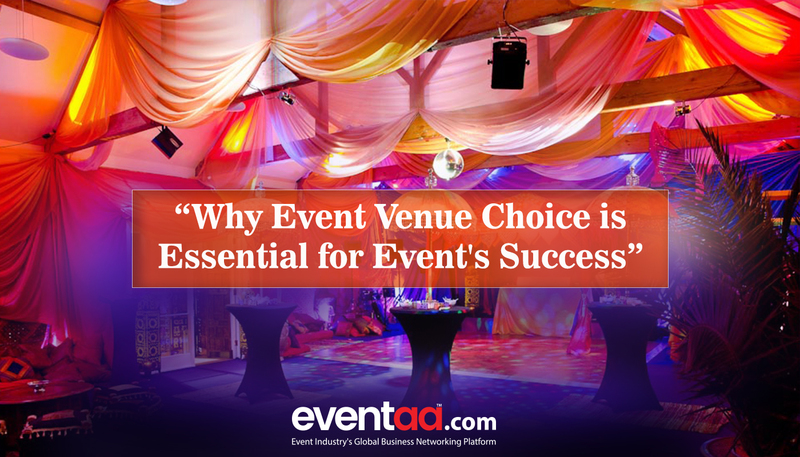 It will ensure that you and venue owners are on the same page. It helps to avoid the conflict and overcome the events ambiguity on the verge of the event. The venue site should not judge only by attendees’ comfort and luxuries but also on your ROI. Hidden charges can rob you if you have booked the event venue in advance and not updated on the latest surcharges. For example, you booked a place in advance and did not know that contract was handed over to another person or third party. Now when the event gets over, the new contractor of venue sends you a bill with revised prices. Bang! Extra expenses incurred. Organizing an unwavering event bespoke about your event organizing skills and detailed observation of events. Any budding event planner would feel less fortunate if your observation goes un-noticed here. Tell your exciting story for event success, or you have witnessed that specially demanded excellent venue choice and why?